Each of Rollins’ three undergraduate business programs is accredited by AACSB International, the world’s premier evaluator of quality business programs since 1916. Fewer than 5 percent of the world’s business programs are accredited by AACSB. With a curriculum based in engaged experiential learning, Rollins’ Business Management Program emphasizes ethical decision making, global perspective, and entrepreneurial and innovative thinking, preparing our graduates for a lifetime of responsible leadership in the global business environment. Learn more about how our AACSB-accredited program prepares you to lead transformational change in any workplace and any industry. Rollins’ International Business Program blends the breadth of a liberal arts education with the depth of an elite business education, giving our graduates the knowledge, skills, and experience they need to succeed in today’s global business environment. It’s why our international business major is ranked among the top 10 programs in the U.S. and No. 1 in Florida. From its elite accreditation to our focus on real-world international experience, find out why Rollins is ranked among the country’s premier international business programs. Study social entrepreneurship at Rollins and build a career out of making the world a better place. As a social entrepreneurship major at Rollins, you’ll develop business skills valuable in any field and learn to use cutting-edge tools like human-centered design thinking to create innovative and sustainable solutions to the world’s most pressing challenges. Learn more about the first social entrepreneurship program in the world to earn accreditation from AACSB International. Rollins’ 3/2 Accelerated Management Program combines a four-year Bachelor of Arts and a two-year Master of Business Administration into a five-year program. 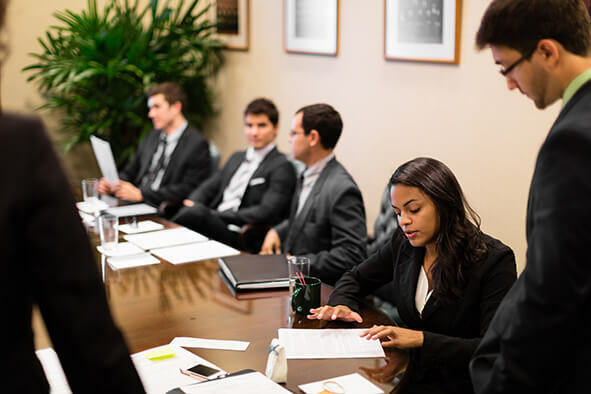 Students spend their first three years working on their undergraduate degrees and their final two years in the Early Advantage MBA Program at Rollins’ Crummer Graduate School of Business, which was recently ranked the No. 1 MBA program in Florida and the No. 44 MBA program in the nation by Forbes. Learn more about how you can earn your undergraduate business degree and MBA in just five years. Designed to provide one of the most comprehensive international business educations in the world, Rollins’ Dual Degree Program allows you to graduate with two bachelor’s degrees in just four years. Dual Degree Program participants earn a BA in international business from Rollins and a BS in international management from Reutlingen University in Germany. Along the way, you’ll develop an understanding of the global marketplace, fluency in English and German, and real-world business skills honed through a semester-long international internship. Learn more about how you can earn a pair of international business degrees in just four years.